AutoFill will not schedule any employee over their set maximum hours per day or week. You can see employee total hours scheduled for the week on the By Employee and the Statistics Weekly schedule views. 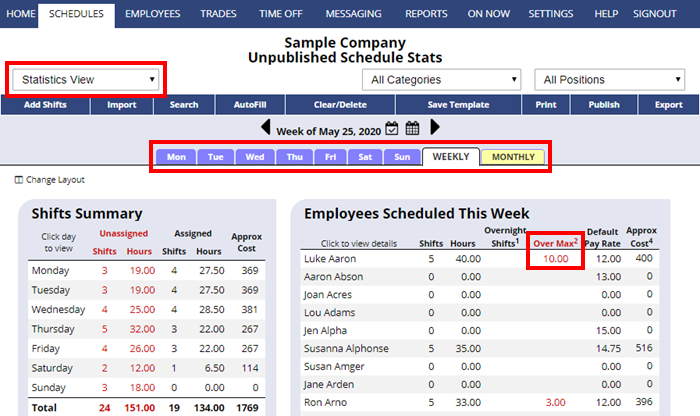 On the Statistics schedule view, you can see the “Hours Over Max” for each employee in red if they are over their maximum per week. You can choose to view Statistics for a Day, Week, or Month (monthly view also allows you to set a target maximum hour per month). You may also use the REPORTS section to create export files of assigned shifts totals for any date range and then open that file in spreadsheet program (like Excel) to compare against the maximum allowable hours for that date range, etc. Also, on the Availability Schedule View you can see the “Hrs left” column just to the right of employee names; if an employee is over their maximum hours, the number is in red, so you can watch for red numbers to know you’ve moved into overtime. Also note that the “By Employee” view shows the total hours scheduled for the week in the display.